I've got no problem with the blooms -- they're quite long-lasting and so cheery! The foliage is nice too, being quite frilly. Not quite feathery, but with a feathery look. It's such a tough plant too! Takes the heat, does quite well with little water -- and I haven't seen any evidence that rabbits or deer like to eat it. 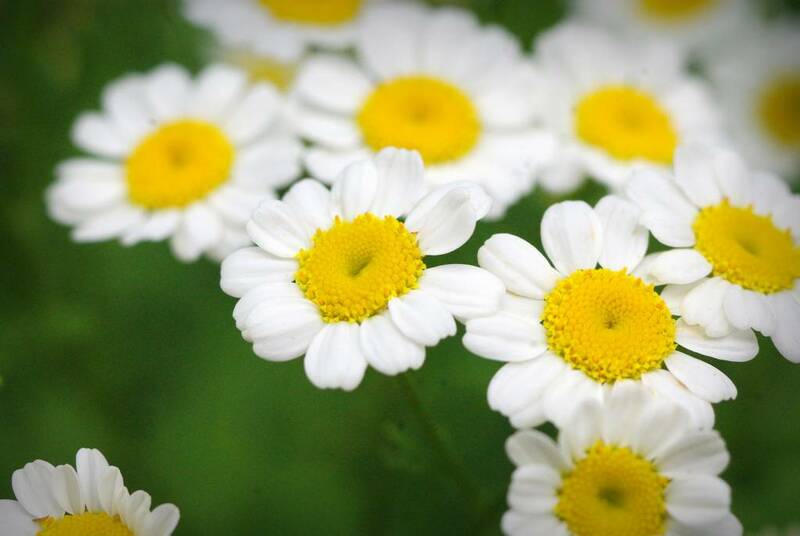 This is probably because the whole plant is somewhat strong smelling -- it's used in herbal medicine apparently. It's not overpowering, but it's definitely not the best fragrance in my garden. I've read that bees don't like it much either, but I just saw a bee happily moving from bloom to bloom and there are plenty of other tiny pollinators out there, so I'd have to disagree with that. 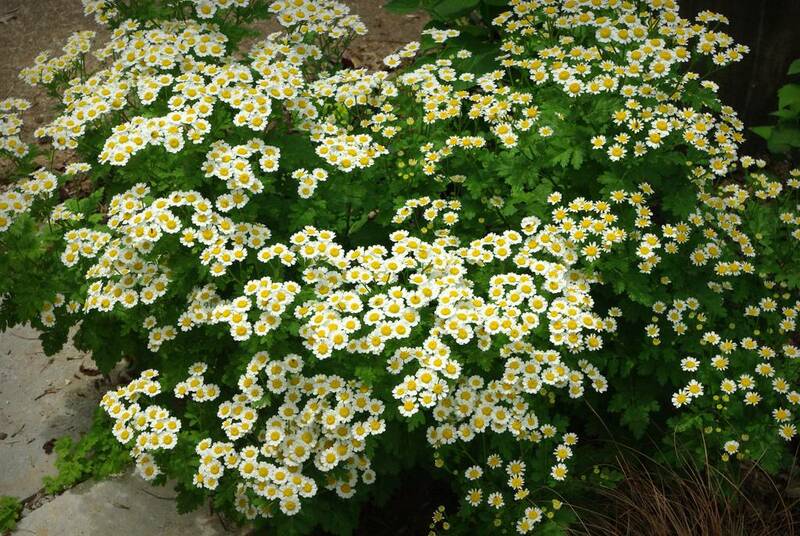 If feverfew has one shortcoming, it's that it reseeds like crazy. Each of those small flowers produces thousands of dust-like seeds, so regardless of the germination rate you're going to see a lot of seedlings. The evidence of this is seen in the cracks of my walkway. I'll have to do some weeding soon. They're nice in the cracks while they're small and frilly, but when they start getting too big it's time for them to go. I personally like having to step around and over a jungle of plants, but I don't want visitors to feel like they must too -- so I always keep my paths and stairways as clear as possible. Don't want somebody hurting themselves out of consideration for my plants! 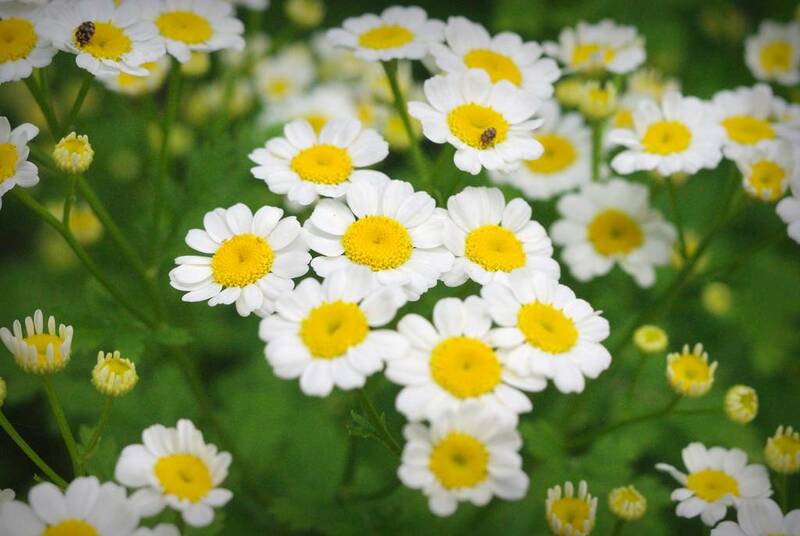 Do you have any experience with feverfew? 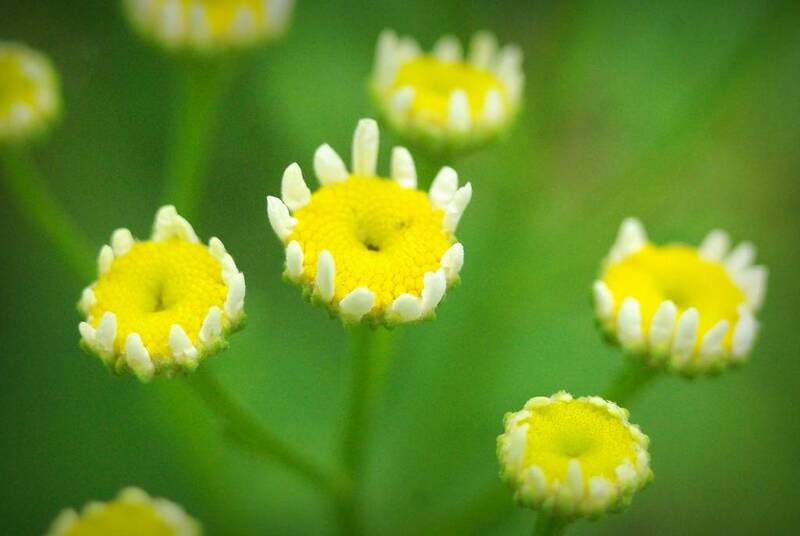 Has it gotten to be such a reseeding nightmare for you that you've given up on this plant? I hope not, as I've just transplanted several seedlings to my tougher growing beds. Beautiful! I've got to look for it. 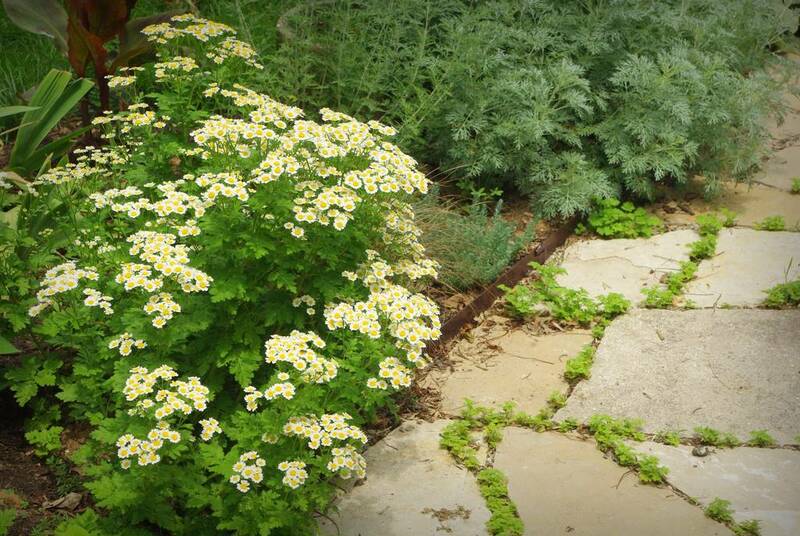 They sometimes sell it as an herb instead of a perennial. The funny thing is that here in California herbs are considered food so there's no sales tax as there would be on ornamental plants. Ditto in Texas, Gerhard. No sales tax on herbs. 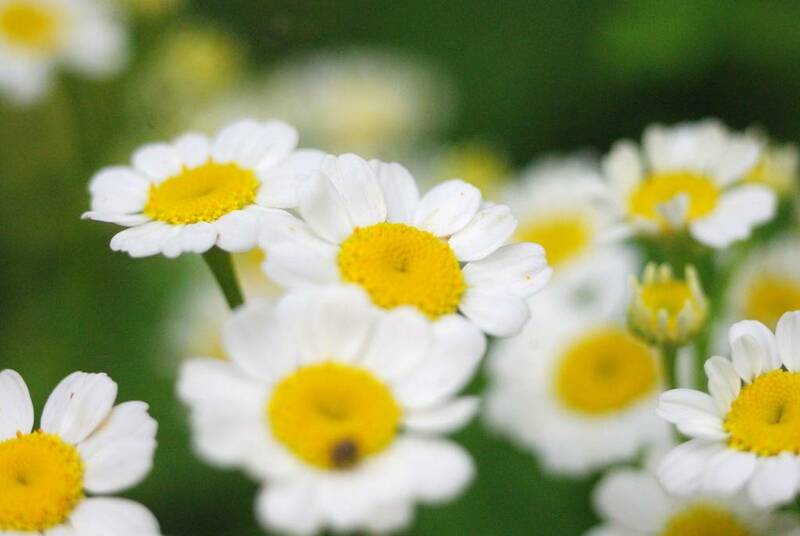 I've never grown feverfew but I once saw a photo I was taken with - a garden bench with the seat planted in feverfew, so said the caption. That's why I'm surprised in your photos to see how tall it gets. 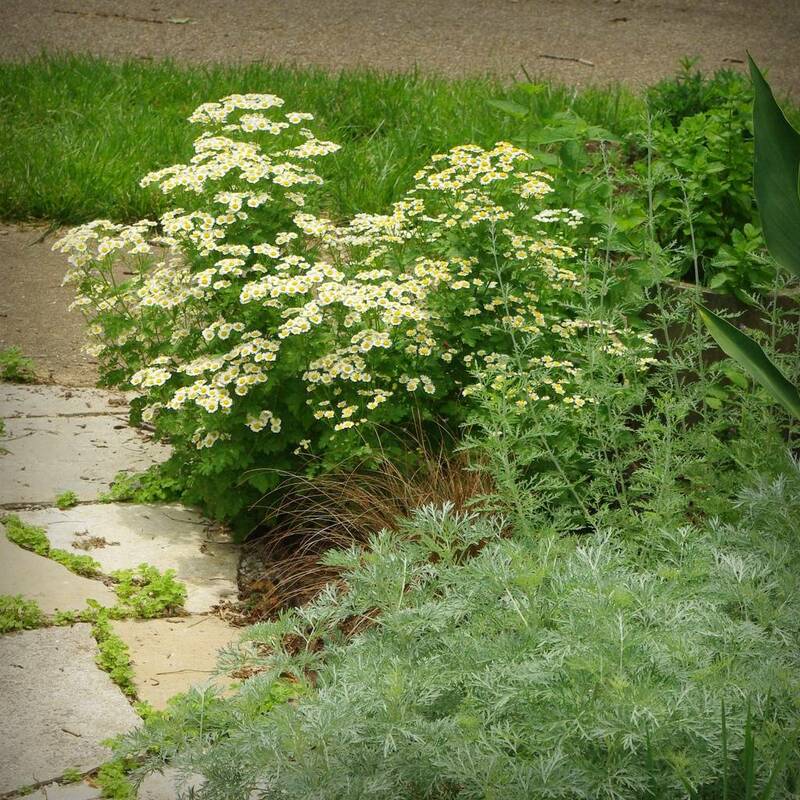 The bench seat was solid blooms, but they were atop very short plants, maybe 4-6". Wonder if there is a dwarf variety? Wow, I would not eat or cook with this! Mine grows about 18" (46cm) tall. It looks like the seedlings are going to produce flowers, so maybe that's what you saw -- a carpet of seedlings that were in flower? I love it! 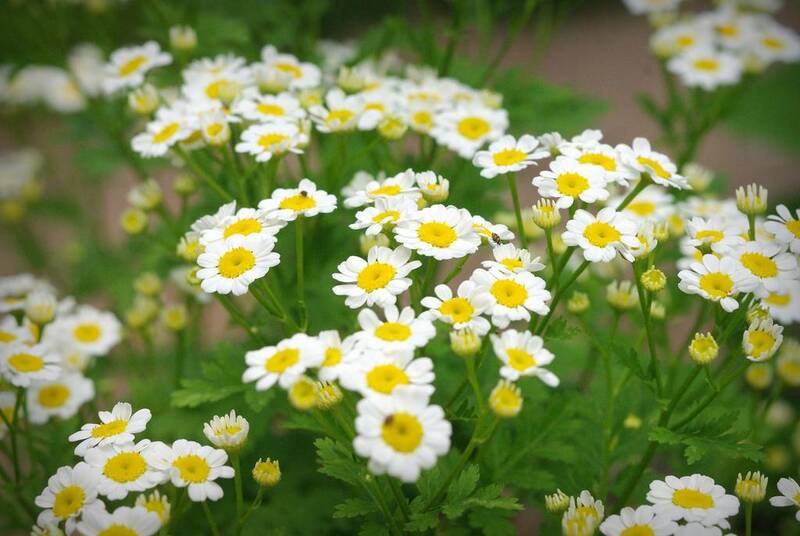 I have seeds for double flowered feverfew that I am planting today. It does reseed like crazy but I usually transplant all of those into my herb bed or give them away. I dry a lot of it for use with migraines. It works great as a tea from fresh or dried leaves, not so good bought off the store as a tablet. It is beautiful in the perennial beds too and makes a good dried flower or filler in a fresh bouquet, if you don't try to smell it.